Today we are finishing our valentine Arendelle and I am so excited to see what you all have created. 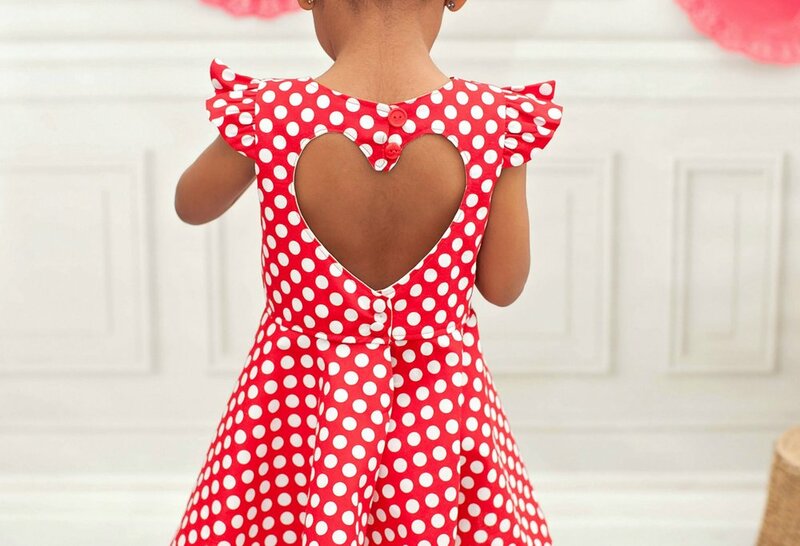 And, it's perfect timing for Valentine's Day, Our little sweeties will look so cute in their heart back Arendelle's. All we have to do is add the buttonholes and buttons. The top closure now has the loops so all you have to do is sew on your two buttons. The bottom closure below the heart will require 2 small buttonholes. You may want to put your buttonholes horizontal if the space is small. 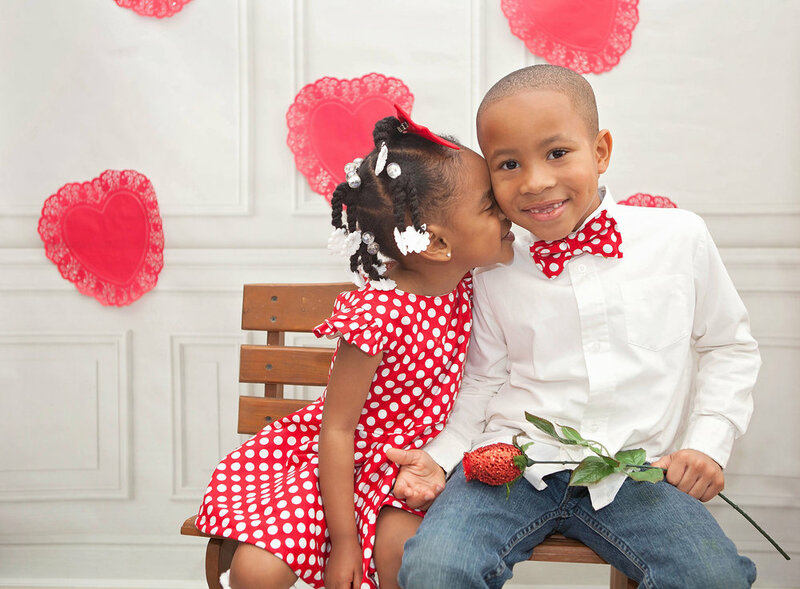 If you have any sons you can make them a coordinating bow tie with our bow tie pattern!!!!!! I hope you enjoyed the sew-a-long! Thanks for letting me be your host! Don't forget to upload a final photo of your Arendelle to the photo album in our facebook group. We are so close to being done and the hardest parts are over. Today we are going to construct and attach our skirt! There are no changes needed for these steps, so follow the directions in the original pattern! Take your time and follow the directions for the placket. They are very easy to follow and result in a beautifully finished placket without puckering! Don't forget to upload a pic of your progress in the album in the facebook group to be eligible to win 3 yards of fabric from Michael Miller! 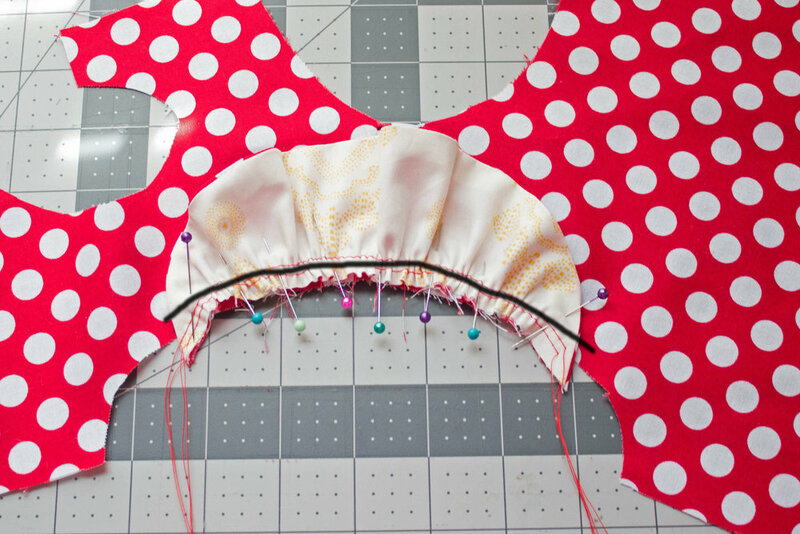 To construct the heart back bodice you will follow the original instructions in the Arendelle pattern. However, you will need to add the two button loops to the upper back bodice. After you have sewn the main front and back bodice pieces together at the shoulders, as well as the lining, cut the corded elastic/ponytail holders so you have two 1.75” pieces. Fold one piece of elastic in half to create a loop. Measure down 3/4" from the top raw edge of the left back bodice piece. Baste the loop in place. Repeat with second piece of elastic. Baste it below the second one, make sure it is 3/4” above the bottom raw edge. You now have several options…..you can add sleeves, flutters or create a sleeveless Arendelle! The flutter pieces can be found in the FREE heart back file. If adding sleeves, follow the directions for constructing and adding the sleeves in the original pattern. If you are NOT adding sleeves OR are choosing to add the flutters, you will follow the directions in the pattern for the sleeveless version. I chose to add the new free flutters and have provided some illustrations on how to do so. 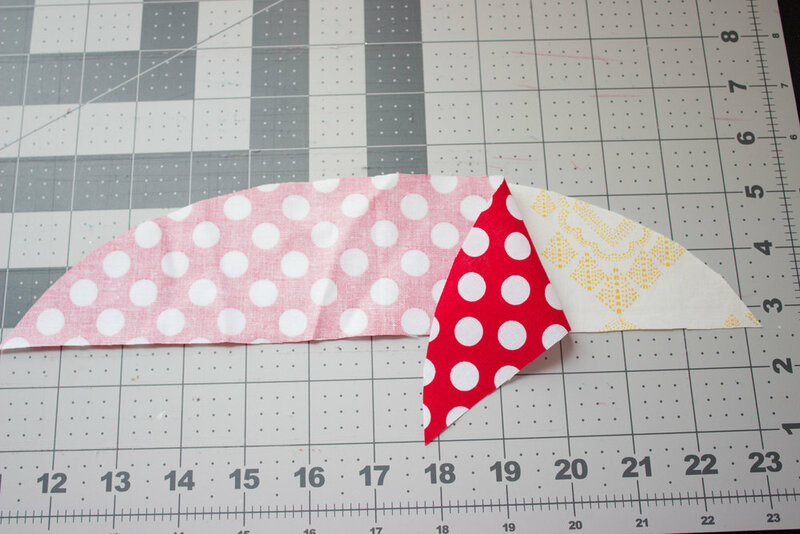 First, place two flutter right sides together and sew to attach along the curved edge. Trim the seam allowance, turn the flutter right side out and press. Sew a gathering stitch 1/4" from the long raw straight edge. Repeat these steps with the other flutter. Gather one flutter and place it on the main bodice. The center of the flutter will be at the shoulder seam. Make sure the front and backs of the flutters are even and are approximately 2" from the raw edges of the arm curve. Do not gather the last 1" of either side of the ruffle. This will help it lay nicely when turned right side out. Distribute the rest of the gathers evenly, using the bobbin thread to tighten the gather of needed. Baste in place. Repeat with other ruffle. You will now continue with the original sleeveless directions. Be careful not to get the flutter caught in any of the bodice seams when finishing the bodice. 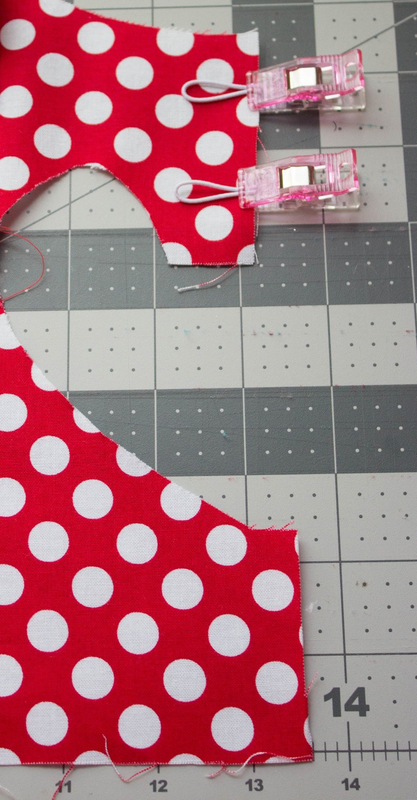 If adding sleeves, follow the directions for constructing and adding the sleeves in the original pattern. When sewing the main and lining, right sides together, around the heart back, be careful to keep a precise seam allowance. When you come to any points on the bodice, leave the presser foot down, lift the needle and turn the fabric as indicated in the photo below. It is very important that you trim the bodice seam allowance. Especially around the heart. Take your time and go very slowly. Be careful not to clip through any stitching. Some of the details of the heart are difficult to turn. But please do not rush this step if you want your heart to look perfect in the end!!!! It’s definitely worth it to trim it up nicely. Turn the bodice right side out and press. Now you can step back and admire that beautiful bodice!! !